Exclusive waterfront dining with enviable views of Fraser Island, Hervey Bay's calming waters and the famous Urangan pier. Relax on the balcony and enjoy something off our NEW breakfast menu. Lunch time diners can enjoy watching the passing marine life (whales if your lucky) and the boats coming and going from the harbour. Relax in the spacious open dining room or on our popular balcony. After the star's come out and the candles are lit, the mood converts into an intimate seaside setting where diners can enjoy the sounds of the ocean and the flickering lights across the water. 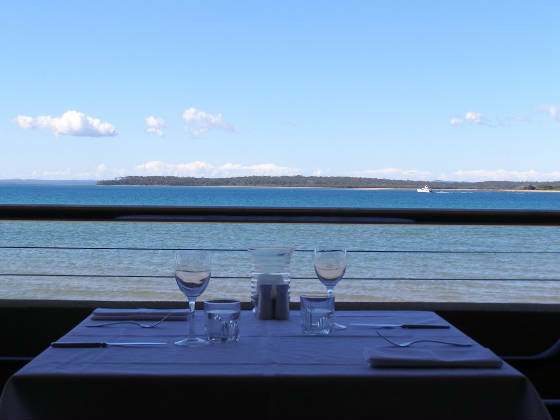 You'll be amazed by the view from every table and the restaurant surrounded by water at a high tide! The waterfront restaurant is not only ideal for breakfast and lunch but is also the ideal venue for weddings, christmas parties, wakes, small or large functions. Our head chef Jody use's only the freshest produce and focuss on the flavors to make each dish unique and an experience!